A few years back it looked as though 3D printing was set to take off. For those who were new to the tech the possibilities seemed endless. And then they didn’t. Soon the 3D printing landscape was littered with a slew of FDM printers that simply parroted one another’s abilities. Within no time the consumer 3D printing market went from boom to bust. Once again, corporate R&D labs and service bureaus were left alone in the additive landscape. Or so it seemed. Hidden behind much of the consumer hype, a resurgence in additive manufacturing innovation has been taking place. New systems that employ novel engineering and chemistry are quickly transforming additive manufacturing into a technology that can compete with (and in some cases is superior to) conventional manufacturing. Of all of the systems in this review, the Continuous Liquid Interface Production—or CLIP system—has garnered the most wide-spread attention. At a TEDTalk in early 2015, Joseph DeSimone, a co-author of the CLIP patent, demonstrated how his machine could print complex models up to 100 times faster than current stereolithography (SLA) technology. According to its inventors, the CLIP technology works by shining a beam of precisely directed, ultraviolet light onto the base of a resin tray above the light source. Once the resin in the tray is exposed to UV light it cures. What separates CLIP from SLA is that between the base of the tray and the resin pool there’s a “tens-of-microns” thick layer of oxygen. That oxygen boundary keeps the resin pool at bay and allows the light source to project its curing waves beyond the resin tray base. In essence, the CLIP system removes the peeling process that occurs after each layer is cured in traditional SLA processes. That means that CLIP systems can continuously “grow” parts rather than stopping between layers. Hence the massive increases in build speed. Although CLIP is fast, it’s still an SLA technology. That means that until some chemistry breakthrough occurs, an SLA is only going to be able to build parts from one material at a time. Though for many applications that is fine. In fact, DeSimone believes that CLIP will be able to blow SLA’s material portfolio wide open (think hydrogels, bio-absorbable resins, silicones, etc.). So while it may be just a single material system, CLIP’s speed could make it a mass-manufacturing marvel as well as an engine for real-time mass-customization. 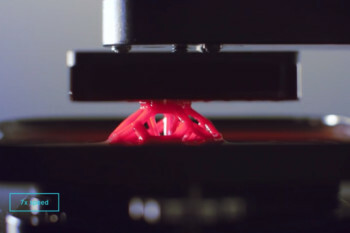 Late in 2013 Hewlett Packard announced it would be entering the 3D printing market with a new technology that would change the way people think about 3D printing. Fast forward 18-months and HP is still teasing its Multi Jet Fusion technology, though in recent months the printing giant has at least advertised how their system works. To begin a print the Multi Jet system deposits a thin layer of powdered material on the print bed, after which an inkjet head containing some 30,000 nozzles douses the material in chemical agent. With a chemical additive in the mix, a number of different properties can be bestowed upon the print material, depending on the interplay between material and agent properties. That’s HP’s secret sauce (not HP sauce), and what makes this technology both intriguing and expandable. Getting back to the print process, with an agent—or possibly agents—in place the powder and chemical are fused together using an as-of-yet unknown energy source. That process repeats until a build is complete. In a performance presentation held at the Inside 3D Printing conference earlier this year, HP’s J. Scott Schiller wowed the audience with one stat in particular. Over the course of 38 hours HP’s engineers pitted their machine against leading FDM and laser sintering technologies to see how many identical gears they could produce. Once time had elapsed the tally looked like this: FDM 460; SLA 1000; Multi Jet 12,600. HP expects their first Multi Jet to hit the market in 2016. If what I was told at AMUG is correct it will only be capable of printing Black Nylon 12 material at first. Sometime later HP’s machine will gain greater capabilities (maybe a firmware tweak?) adding full color (which it can already produce, but won’t be in the first edition) and possibly the ability to print models in ceramic, medical grade materials and even materials with multiple material properties—such as conductivity and elasticity. When those improvements will come to be is still a mystery. If HP can live up to their forecasts, however, Multi Jet Fusion might provide a very interesting manufacturing solution. 3D Systems’ answer to the high speed printing question comes in a package that looks a lot like an assembly line. Named High Speed Fab Grade (HSFG) printing, this new system whizzes print plates around an oval track that’s covered with strategically placed print heads. As the plates continuously race around the system the print heads above place dots of polymer wherever needed to build a model. According to 3D Systems, the HSFG machine can deposit 4 billion full color polymer dots (and possibly even conductive material) every minute, making it 50 times faster than current jetting technologies. In addition to its speed and accuracy, the HSFG can utilize any plate from the “print line” at any time so that further post-processing work can be done to a model. With that capability 3D Systems appears to be positioning their machine as both a standalone system and one that can be plugged into an already existing manufacturing workflow. At the moment 3D Systems’ new system is still a work in progress. As of this writing no system price or delivery date have been established. In most cases that lack of stats would make the HSFG hardly worthy of a footnote, but there’s one thing buoying this project: Google. For some time Google has been interested in producing a modular cellphone (dubbed Project Ara) that gives users the ability to customize the sensors, interface and aesthetics of their mobile. One of the major components of Project Ara was developing a platform that could provide users with an unimaginable variety of material and aesthetic customization options. Even though Google is a behemoth, they outsourced this job to 3D Systems asking them to build their next gen fabbing machine. I’d say that makes 3D Systems’ machine, at the very least, a promising option for additive’s near-distant future. To bring this review back into a more contemporary timeframe, I’d like to end with a preview of Neil Hopkinson’s High Speed Sintering Machine. At this past AMUG conference, I listened as Dr. Hopkinson explained to a packed room what his technology could do. Here’s the gist. Traditional laser sintering uses a laser to fuse polymers together layer by layer. The process is accurate, but it’s time consuming due to the laser’s movement speeds. To work around that time variable Hopkinson’s team has swapped a sintering laser for an infrared heat source and an ink-jet print head. In this new process the print head deposits polymers onto a print surface where they’re fused together instantly by the infrared heat source moments after being deposited. Dr. Hopkinson’s high speed printing process has already proven to speed up build times when compared to traditional sintering. However, the technology is still working its way through the university R&D system. That being said, during his AMUG talk Hopkinson described how high speed sintering could be scaled-up to create parts 100 times faster than today’s best sintering machines. To do this Hopkinson and his team are working on ways to build larger print beds that can accommodate more build area and better choreograph the movement of both print heads and the infrared sintering systems. If these systems can be scaled up in that manner, hundreds of objects could be built simultaneously and rapidly. Ever the realist, Hopkinson noted that while high-speed sintering might one day be able to compete with injection molding, it could only do so when making small, complex parts. In addition to its speed, Hopkinson’s sintering machine is being developed to process new materials—including ceramics and conductive inks—that would allow it to embed electronics directly into a component. Still, a good deal of work needs to be done on the material level to make high-speed laser sintering a viable solution. If all goes to plan, high-speed laser sintering should make its market debut in 2017. Over the past 24 months the world’s perception of 3D printing has changed. While the hype (and even hysteria) that surrounded the industry has faded, a new current of high speed printing has begun to emerge. Will these new technologies supplant traditional manufacturing? That’s not likely in the near term, and probably not possible for many applications. But this new evolution in 3D printing could begin to rival injection molding, IC manufacturing and other processes within the next decade. What’s even more incredible is that these technologies aren’t even the vanguard of manufacturing’s future. Emerging tech like 4D printing, xerographic micro-assembly and bio-printing are already making headway in labs across the globe. Manufacturing’s future is bright—and has a decidedly additive edge.